Contemporary Aboriginal poetry is an important part of Aboriginal art. Many poems express how Aboriginal people feel today and their poems are about the challenges that they share with non-Indigenous people but also about problems specific to their lives. 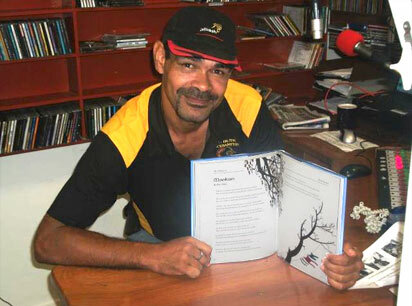 The Aboriginal-owned Koori Mail newspaper regularly publishes poems written by Aboriginal people. Do you write poetry? Are you of Aboriginal or Torres Strait Islander descent? I'd love to publish your writing. Contact me and send me your poem! Maybe someone discovers your talent just like Dan's (see box below) or Coralie's poem 'No Disgrace' which was published in an Australian school textbook. Roots of a Woman, Julie Saunders, St George, QLD. Dan with his published poem. Photo used with kind permission. The UK-based Commonwealth Education Trust (CET) chose Dan Davis' poem Mookari to represent Australia in its 125th anniversary anthology. One poem or story is chosen from each country of the Commonwealth. The CET found his poem after it was published here on this website. Congratulations, Dan! "Just a short email to let you know that I have had a couple of students get in touch with me via email regarding two of my poems on your website which they have chosen to read out in the classes one student in Perth and one in Darwin. Thank you so much for the chance to get my poetry out there and in the community, it is very much appreciated." Nola's poetry has been published by the NSW Department of Education in their School Magazine for NAIDOC week, in an academic book titled Performing Cultural Tourism and an English language school book titled Hit the Road.